Identification. 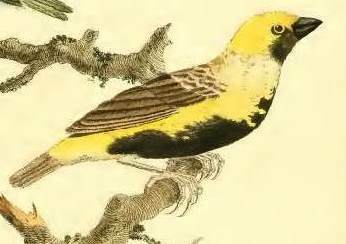 The Yellow-crowned Bishop is small with a short tail. The male in breeding plumage is black with golden upperparts other than a black nape band. The width of the nape band and the amount of yellow on the sides of the neck varies in the different subspecies. 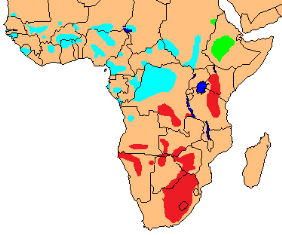 Euplectes afer afer is found in western Africa (light blue on map). E a strictus is found in Ethiopia (green on map); this race is larger than the nominate, the breeding male has a narrow black band on the hindneck, and the yellow on the side of the neck extends to a point behind the lores. 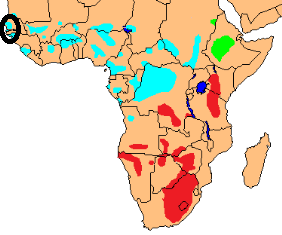 E a taha is found in southern to eastern Africa (red on map); the breeding male has a prominent black band on the nape, with some yellow feathers on the side of the breast and flanks. In southern Africa there are many recent records for this species around the edge of its range. In particular, there seems to be a range expansion into the Western Cape. It also often shows local nomadic movements. There are established populations, mostly due to escaped cagebirds, in the USA and West Indies; and small introduced populations in Portugal and Spain. Habitat. 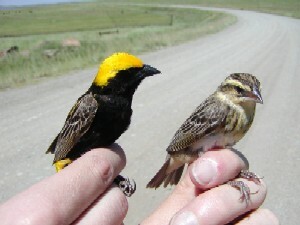 The Yellow-crowned Bishop inhabits open grassy valleys, usually at low altitudes, and is generally closely associated with wet areas. It breeds in very wet areas such as swamps or seasonally flooded habitats. Food. 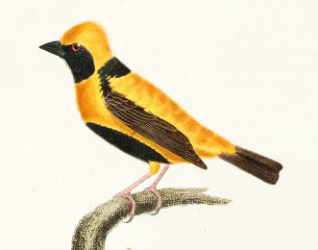 The Yellow-crowned Bishop feeds mainly on small grass seeds. In winter it feeds on a greater variety of grass species, including young maize. Nestlings are fed on insects. Breeding. Displaying males are attractive as they fluff out the yellow feathers on the back while flying over their territories. The nest is an oval ball, built of grass strips and lined with grass seedheads. The nest is supported by vertical grass stalks with a side entrance near the top. The nest is built by the male - the female lines the nest. Nests are well hidden in a tuft of grass, sometimes in bushes, or in rushes and sedges. Nests are usually in waterlogged or flooded areas, <1 m above the ground or water surface. The clutch size is 2-4 (mean 3). Eggs are incubated by the female. The young are initially fed by the female, and later by both sexes.